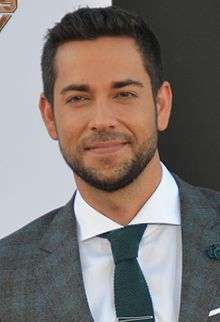 Zachary Levi Pugh (/ˈzækəri ˈliːvaɪ ˈpjuː/; born September 29, 1980), known professionally as Zachary Levi, is an American actor, director, and singer. 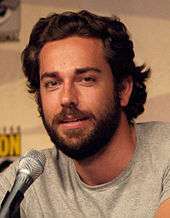 He is best known for playing Chuck Bartowski in the series Chuck. He also appeared in the films Alvin and the Chipmunks: The Squeakquel, Tangled, and Thor: The Dark World. Levi recently starred in the lead role of Georg Nowack in the 2016 Broadway revival of She Loves Me opposite Laura Benanti. The production began previews at Studio 54 on February 19, 2016 and opened on March 17 for a limited engagement through June 12. The run was later extended through July 10, where it then closed. Levi was nominated for a Tony Award for his performance. In 2010, Levi voiced Flynn Rider in the animated film Tangled, in which he performed the duet "I See the Light" with Mandy Moore; the song won a Grammy for Best Song Written for Visual Media. He later reprised the role in the short film Tangled Ever After, and will return to voice Flynn Rider again in a Disney Channel television series based on the film in 2017. Levi was born in Lake Charles, Louisiana, the son of Susan and Darrell Pugh. He is of Welsh ancestry. When Levi was a child, his family moved across several states before finally heading back to their home in Ventura, California, where he attended Buena High School for four years. He began acting on stage at the age of six, performing lead roles in regional productions such as Grease, The Outsiders, Oklahoma!, Oliver!, The Wizard of Oz, and Big River at the Ojai Art Center. He chose his middle name as his stage name because his agent told him that "a guy named Zach Pugh would not be going far in Hollywood". 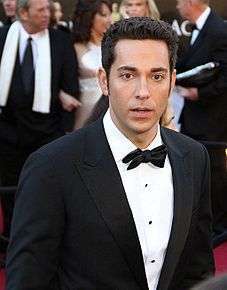 He landed the starring role in Chuck in 2007. Levi and his Chuck co-star, Yvonne Strahovski, were both nominated for Best Action Actor and Actress Choice TV Series for the Teen Choice Awards 2010 where they both won and presented. In the summer of 2008, Levi was named one of Entertainment Weekly's Top Thirty People Under Thirty. He later starred in the film Alvin and the Chipmunks: The Squeakquel in the lead role as Dave's cousin Toby Seville. In 2010 he is presented Kids' Choice Awards, were both a winner for Alvin and the Chipmunks: The Squeakquel in Best Favorite Movie. He starred in the 2010 Disney-animated feature film Tangled, which is based on the popular fairy tale Rapunzel. He voices Flynn Rider, a bandit who finds refuge in Rapunzel's tower. He provided narration in the 2011 film Under the Boardwalk: The Monopoly Story, a documentary about the game of Monopoly. Levi hosted the 2011 Spike Video Game Awards. BuddyTV ranked him #97 on its list of "TV's Sexiest Men of 2011". Levi landed the male lead in the 2012 TV pilot Let It Go, which would have aired on Fox, but was not picked up. Levi hosted the web documentaries Tomb Raider The Final Hours, going behind the scenes of the new Tomb Raider game. He was originally to portray Fandral in Thor, but had to drop out due to scheduling conflicts with Chuck. He did play the role in the sequel, Thor: The Dark World (2013), after original actor Josh Dallas had scheduling conflicts of his own. Levi made his Broadway debut in a production of the musical comedy First Date in August 2013. In June 2015, it was confirmed that Levi and Moore would reprise their roles as Eugene and Rapunzel in the television series based on the film Tangled. The animated series, set between Tangled and Tangled Ever After, will air on Disney Channel in 2017. On September 1, 2015, it was announced that Levi will join the cast of the upcoming Broadway revival of She Loves Me in the lead role of Georg, alongside Laura Benanti as Amalia. It opened March 17, 2016 to high critical praise, scoring 5 Stars from The Guardian and being selected as a Critics' Pick for The New York Times. Critics praised Levi's performance of Georg, noting that his portrayal is "suave and handsome at times, disarmingly nebbishy at others," and that he "[exudes] sweet modesty and just a pinch of hauteur". Levi was rewarded for his performance in She Loves Me with a Tony nomination for Best Performance by an Actor in a Leading Role in a Musical. The show closed July 10, 2016 after an extended run, which included a historic livestreamed performance on June 30, with Levi and the cast participating in the first livestreamed show in Broadway history. Levi is a sports car and motorcycle enthusiast and owns a 2009 Nissan GT-R. He is an avid gamer, having first played Super Mario Bros., and has come to appreciate video games for their ability to provide interactive stories. Levi is a Christian and has been since childhood. In a 2002 interview with Relevant Magazine, he said: "My job on my set, I believe, is to first just love people and gain that trust with people where they know that I really do love them and care about their well-being, so that when they are running into problems, they will hopefully, at some point, come to me and ask me, 'What is your peace all about? What is your comfort all about? Where do you get your love? Where do you get your talents?' And I can turn to them and say without blinking, 'Jesus Christ.'" On June 16, 2014, Canadian actress Missy Peregrym announced that she and Levi had married in Maui, Hawaii. They filed for divorce in April of 2015, with the separation date listed in court documents as December 3, 2014. 2006 Worst Week of My Life Nick Episode: "Pilot"
2015 Hollywood Game Night Himself Episode: "Don't Drink and Game Night"
On February 27, 2011, Levi performed "I See the Light" with Mandy Moore at the 83rd Academy Awards. On June 12, 2016, Levi performed the title song from "She Loves Me", as part of the medley presented on the 70th Tony Awards. However, he has performed live in various programs from childhood. 1 2 "Zachary Levi". TV Guide. Retrieved 2011-08-03. ↑ Cox, Gordon. "Zachary Levi to Star in Broadway's 'She Loves Me' Variety.com, September 1, 2015. ↑ "Broadway's She Loves Me, Starring Laura Benanti, Zachary Levi & More, Sets New Dates". ↑ "She Loves Me Announces Broadway Extension | Playbill". Playbill. Retrieved 2016-04-22. ↑ "She Loves Me Closes on Broadway Today | Playbill". Playbill. Retrieved 2016-07-12. ↑ "The Tony Award Nominees - Shows". TonyAwards.com. Retrieved 2016-05-23. ↑ "Complete List of Nominees for the 54th Annual Grammy Awards". ↑ "Grammys: 54th Grammy Awards nominees". Los Angeles Times. 1 2 Bryant, Jacob (March 8, 2016). "'Tangled' Animated TV Series Based on Film Coming to Disney Channel". Variety. Retrieved April 10, 2016. 1 2 Wyatt, Edward (September 30, 2007). "Super Nerd Is Out to Save the World". The New York Times. Retrieved August 21, 2010. ↑ "Anytime with Bob Kushell feat. Zach Levi". Anytime with Bob Kushell. Season 1. Episode 8. February 5, 2009. ↑ Lisotta, Christopher (May 16, 2005). "SPECIAL REPORT: Upfront Navigator". Television Week. 24 (20). pp. 32–37. ↑ Stransky, Tanner (August 9, 2010). "2010 Teen Choice Awards winners announced". EW. Retrieved March 8, 2011. ↑ Markovitz, Adam; Tanner Stransky (March 3, 2008). "30 Under 30: The Actors". Entertainment Weekly. Retrieved March 10, 2009. ↑ Corliss, Richard (January 11, 2010). "Alvin and the Chipmunks: The Squeakquel". Time. 175 (1):51. ↑ Wright, Anders (March 2, 2011). "Rolling the dice". San Diego City Beat. Retrieved March 25, 2011. 1 2 Webb, Charles (2011-12-05). "Spike VGAs Interview: Meet Your Host, Zachary Levi". MTV. Retrieved 2011-12-07. ↑ "Pilot Scoop: Zach Levi to Headline Fox's Let It Go". TvLine. Retrieved February 13, 2012. ↑ "'Thor 2': Zachary Levi Eyed For Fandral, Josh Dallas Out Of Film". huffingtonpost. June 6, 2012. Retrieved October 3, 2012. ↑ Carlson, Adam (May 20, 2013). "Zachary Levi made his Broadway debut in 'First Date'". Entertainment Weekly. Retrieved August 19, 2013. ↑ Ausiello, Michael (January 16, 2015). "Zachary Levi to Lead Heroes Reborn Miniseries on NBC". TVLine. Retrieved January 16, 2015. ↑ "'Heroes Reborn' canceled as NBC plays the 'limited series' card". TV By The Numbers by zap2it.com. Retrieved 2016-04-22. ↑ Ausiello, Michael (January 7, 2015). "Chuck Vet Zachary Levi to Play Abraham Lincoln in Deadbeat Season 2". TVLine. Retrieved January 16, 2015. ↑ Soloski, Alexis (2016-03-18). "She Loves Me review – a show to fall head over heels for". The Guardian. ISSN 0261-3077. Retrieved 2016-04-22. ↑ Brantley, Ben (2016-03-17). "Review: 'She Loves Me' Is a Daydream of the Ordinary". The New York Times. ISSN 0362-4331. Retrieved 2016-04-22. ↑ "She Loves Me". Time Out New York. Retrieved 2016-04-22. ↑ "Laura Benanti, Zachary Levi in 'She Loves Me': Theater Review". The Hollywood Reporter. Retrieved 2016-04-22. ↑ Cox, Gordon (2016-06-15). "Tony-Nominated 'She Loves Me' To Be Broadway's First Livestream". Retrieved 2016-07-12. ↑ "Terrified featuring Zachary Levi on Entertainment Weekly". Retrieved 2011-08-03. ↑ "Terrified premieres on Vevo today!". Retrieved 2011-08-03. ↑ Carlozo, Louis R. (April 4, 2006). "Grown". Christian Century. 123 (7). p. 55. 1 2 Skerry, Kath (February 27, 2011). "Zachary Levi Sings at the Oscars (Video)". Give Me My Remote. Retrieved March 8, 2011. ↑ Carolla, Adam (July 16, 2010). "Zach Levi". CarCast. Retrieved September 12, 2010. ↑ Nygaard, Sandra (October 2007). "With a name like Levi, he's gotta know jeans". Men's Health. 22 (8): 134. ↑ "Q&A With Zachary Levi". Relevant Magazine. Retrieved October 13, 2009. ↑ "Zac Launches The Nerd Machine". ChuckTV.net. Retrieved September 24, 2010. ↑ Sands, Rich (February 1, 2011). "Justin Bieber, Ty Burrell and Zachary Levi Hoop It Up for NBA All-Star Celebrity Game". TV Guide. Retrieved October 3, 2012. ↑ Marquina, Sierra. "Zachary Levi Secretly Marries Girlfriend Missy Peregrym In Maui: Pic – Us Weekly". Usmagazine.com. Retrieved 2014-06-17. ↑ "Zachary Levi and Missy Peregrym Are Divorcing". 20 April 2015. ↑ "Zachary Levi & Missy Peregrym Secret Wedding Ends In Even More Secret Divorce". TMZ.com. Retrieved 2015-04-18. ↑ "Yahoo! 's Fall Comedy Lineup Set to Launch on September 9, 2013 with Eight Original Shows and the Exclusive Saturday Night Live Archive Clips – Ratings". TVbytheNumbers.Zap2it.com. Retrieved 2014-06-17. ↑ "Ed Helms, Zach Levi Star in 'Tiny Commando' for Yahoo (Exclusive)". TheWrap. 2013-04-26. Retrieved 2014-06-17. ↑ "Tomb Raider (The Final Hours: Surviving Together)". viddler.com. January 8, 2013. Retrieved August 19, 2013. ↑ "iTunes – Music – First Date (Original Broadway Cast Recording) by Various Artists". Itunes.apple.com. 2013-09-24. Retrieved 2014-06-17. ↑ "iTunes - Music - She Loves Me (2016 Broadway Cast Recording) by Various Artists". Itunes.apple.com. 2016-06-10. ↑ "Tony Awards Show Will Feature 10 Performances | Playbill". Playbill. Retrieved 2016-07-03. 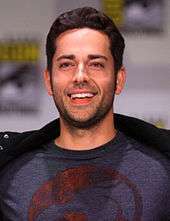 Wikimedia Commons has media related to Zachary Levi.